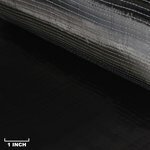 Learning Center - What are Unidirectional Carbon Fiber Fabrics? What are Unidirectional Carbon Fiber Fabrics? Unidirectional carbon fiber fabric is a type of carbon reinforcement that is non-woven and features all fibers running in a single, parallel direction. With this style of fabric, there are no gaps between fibers, and those fibers lay flat. There is no cross-section weave that divides the fiber strength in half with another direction. This allows for the concentrated density of fibers that provide maximum longitudinal tensile potential—greater than any other weave of fabric. For comparison, this is 3 times the longitudinal tensile strength of structural steel at one-fifth of the weight density. Likewise, composite parts made of carbon fiber provide their ultimate strength in the direction of the fiber grains. Thus, composites parts that use unidirectional carbon fiber fabric as their exclusive reinforcement provide maximum strength possible in just the two directions (in the direction of the fiber), and are extremely stiff. This directional strength property makes it an an isotropic material, similar to wood. During layup of a part, the unidirectional fabrics can be overlapped at varying angle orientations to achieve strength in multiple directions without sacrificing stiffness. Also during layup, unidirectional fabrics can be layered with other carbon fiber fabric weaves to obtain different directional strength properties or aesthetics. Unidirectional fabrics are also available in very light weights; even lighter than their woven counterparts. This allows for more controlled constructions of precision parts and precise engineering in layups. Also when compared to woven carbon fiber, Unidirectional Carbon Fiber is also more economical. This is due to its lower overall fiber content and less intensive weaving process. This can save on production costs of otherwise perceptively expensive, but high-performance, parts. The greatest advantage for unidirectional carbon fiber reinforcements is also their greatest disadvantage. They are not appropriate for parts that require a great anisotropic strength property (strength in all directions). Composite parts used in automobiles and other multi-dimensional applications that require strength in all directions should use a different style of weave, such as a plain, twill, or satin weave. You can find this other styles on our website as well. As another potential disadvantage, composite parts made from unidirectional carbon fiber have a very plain, single-grain finish. If the fabricator wants to have that beautiful, signature carbon fiber finish, they will commonly use a single layer of woven fabric as the outermost layer of their layup. Bike frames, for example, are commonly made with multiple layers of unidirectional fabric laid up at different orientations for maximum strength and stiffness, and then finished with a 3K Twill Weave Carbon Fiber Fabric (#1069) for that “signature” carbon fiber appearance. Unidirectional reinforcement is ideal for applications where front-to-back strength is most important. For example, long, tubular structures that move only in a forward-and-reverse direction—such as rockets, airplanes, and boats—often use unidirectional carbon fiber as their reinforcement. You will find that most carbon fiber tubes used in frames—like back packs, bicycles—use unidirectional carbon fiber for its light weight and superior stiffness. For the recreational and hobbyist markets, it is also commonly found in model aircraft, UAV’s, model boats, model rockets, bicycles, and recreational sticks (hockey, hiking, lacrosse, etc.). Advances in carbon fiber and resin have also made unidirectional carbon fiber reinforcement more popular for use in architectural and structural engineering. Because of carbon fiber’s outstanding strength, it makes for an ideal replacement for wood or metal in these applications, such as bridges and building restorations. Carbon fiber, in its many composite forms, reduces construction time, provides greater durability, and minimizes maintenance costs. 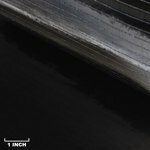 The light weight and stiffness of unidirectional carbon fiber is also being utilized in wide turbine blades. According to this article from Composites World, the increased stiffness and lighter weight allows for longer, thinner blades. The added length results in larger sweep areas, and the thinner, lighter blades are more sensitive to air movement, both of which provide a greater energy output. Unidirectional carbon fiber sleeves are also being used in sports outside of bicycle frames and sticks. The combination of outstanding fatigue resistance, light weight, and rigidity make unidirectional carbon fiber ideal for prosthetic blades, such as those used by Paralympic sprinters. Undirectional carbon fiber fabrics are also being used in the sole of sprinting and cycling shoes to provide extreme stiffness with minimal weight in racing scenarios where energy efficiency is critical. Fibre Glast features a selection of true non-woven unidirectional fabric. In our unidirectional fabrics, the fibers are bound by a trace amount of polyester binder that composes less than 3% of overall construction. They are finished with a light sizing chemical to keep the fibers from fraying during handling. The binder is only used on one side of the material to provide a clean, opposite face of the carbon with no twisting or crimping of fibers. Other brands of unidirectional fabric sometimes have a slight weave in-and-out of the binder, which is not a true unidirectional fabric. Even a slight weave reduces the single direction maximum strength. All of Fibre Glast’s unidirectional fabrics are 12” wide. This width makes them easy to work with, as they can be laid up side by side for a seamless final part. This also makes them easier to store, carry, and ship. All of our fabrics also use a fiber with at least a 33.4 tensile modulus for outstanding stiffness, and a minimum 711 KSI for tensile strength. Our Intermediate Modulus fabric boasts a 40 MSI modulus and 820 KSI tensile strength. These properties will change in your laminate part, much depending on your resin. For example, a typical laminate made with our #2596 Intermediate Modulus fabric will feature a tensile strength of at least 470 KSI. You can compare this to steel which can claim up to 80 KSI. Like other fabrics, unidirectional fabrics are categorized by weight as “ounces per square yard”. Therefore, a 9 ounce fabric weighs 9 ounces per square yard. Generally, the heavier the fabric, the greater the number of fiber are used to build thickness and thus strength in the final composite part. Also like other fabrics, you can lay up additional layers for additional strength. 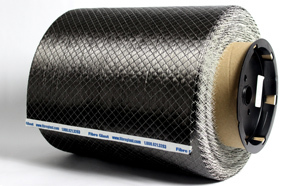 Fibre Glast currently offers four varieties of unidirectional carbon fiber fabrics. Below is a summary of each fabric, so you can find one to meet your unique need. This 4.0 ounce-per-square-yard carbon fiber fabric is our lightest weight of our unidirectional carbon reinforcements. It is only four ounces per square yard of material. The light weight makes it great for precision layups, and unmatched for extremely light weight parts that don’t require the extreme strength provided by bulkier fabrics. Because of this, it is popular for ultralight parts like model aircraft, boats, UAV’s, or rockets. It can also be used for recreational applications like hockey sticks and hiking sticks. This unidirectional is made with an Intermediate Modulus fiber. Fiber Modulus is the measure of the fiber’s stiffness. The Intermediate Modulus fibers we use have a tensile modulus of 40 Msi, providing greater stiffness than the Standard Modulus fibers (20 Msi) used in our other fabrics. Because of this, it is commonly used for the aerospace industry or high-performance racing applications that demand maximum stiffness single-direction strength properties. The light weight still works well for other precision, but high strength, professional applications. This fabric is also now available as a prepreg (#2114), which includes resin system already built into the fabric. You can store this fabric at room temperature (up to 12 months), then apply heat and pressure to cure it. This process yields maximum strength-to-weight properties, which is always sought after in aerospace applications. Our nine ounce fabric provides a little more thickness and strength for greater fatigue resistance on more demanding parts. This fabric utilizes a standard modulus fiber with a tensile modulus of greater than 20 MSI. It is easier to work with than some of the thinner, lighter weight fabrics, and wets out easily. This is used most widely for all marine use, including boat hulls, racing boats, and even deck beams on yachts. This fabric is also commonly used for recreational sticks and bicycle frames. Like the previous fabric, this fabric is also available as a prepreg (#2112) with our room temperature resin already integrated. In addition to the benefits mentioned above, the prepreg process also minimizes mess and saves time in carbon fiber composite production, making this particular fabric a favorite for bicycle frame manufacturers. Finally, our 22.3 ounce-per-square-yard fabric is the heaviest of our unidirectional fabrics. It is used with larger 24K tows to provide a very thick (.030”) fabric. This heavy of a fiber tow requires a different binding system, which is where the state-of-the-art quilted binding makes this possible. The trace ±45° binder is still only on one side of the fabric, providing a smooth, clean finish with the alternate side. All fibers maintain their untwisted, true non-woven properties as found in the rest of our unidirectional fabrics. 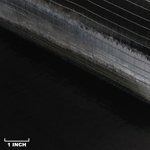 This fabric is used for heavy applications, like architectural reinforcement, including bridges, masts, and buildings. This fabric will be a favorite among engineers looking to increase the strength of structures formerly made of wood or steel. When using unidirectional reinforcements, be sure to face the smooth, carbon-only side of the fabric outward for the cleanest finish. Also, spread the resin in the direction of the fibers—going against the grain will cause the nonwoven fibers to break free from their binder. Wet layup is most common with unidirectional, and a vacuum-bag process will provide your greatest strength-to-weight ratio. For best results, use a vacuum infusion process to achieve ideal resin-to-fabric ratio, or our prepreg unidirectional fabrics described above. When compared to a woven fabric, vacuum infusion will be slightly more difficult due to the slower resin infusion process. We also recommend our System 2000 Epoxy as the preferred resin when making a composite part from our unidirectional carbon fiber reinforcements. All finishes on our fabrics are compatible with our resin systems.